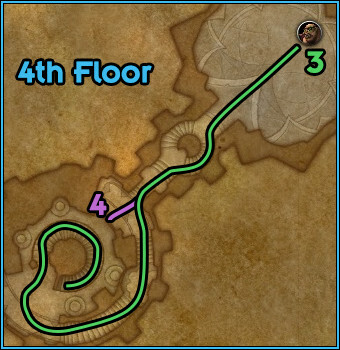 When you reach level 4 in your Mythic+ dungeons, you will start to see affixes attached to the keystone which add additional effects to enemies within the dungeon. Each tier (4, 7, and 10) cannot be duplicated within one keystone, so you will have one of each at higher levels and they will cycle each week. Combinations can vary in difficulty and how much they synergise with each other and the instance in question, but all of them have an impact and have to be dealt with in different ways. Raging. When targets reach 30% health, they Enrage, and deal 100% bonus damage. This encourages burning enemies down individually when they reach this point, or saving hard crowd control like stuns for when they reach this point during AoE. Bolstering. Whenever an enemy dies, it buffs other enemies in combat with an additional 20% health and damage, which heavily encourages killing them at the same time, or within a small window of each other. In larger groups, this can be deadly if mis-managed. Note this does not, however, interact with adds summoned via boss mechanics. Sanguine. When enemies die, they leave a small pool on the ground which deals damage to players and heals enemies standing within them. This increases the awareness requirement, and means you need to reposition groups quickly around them. Teeming. The dungeon itself will generate additional lesser adds, which increases the number of targets in pulls. This mostly increases the difficulty of pulls as additional enemies will be active in each pack. Bursting. When minions die within the dungeon, all party members inside will receive a stacking debuff that deals 5% of their maximum health every 2 seconds for 4 seconds. This requires the party to kill targets in a staggered fashion to prevent it stacking too high and killing off players, and for the healer to be acutely aware of the state of the party health when it is applied. Volcanic. This causes random patches on the ground to spawn that will deal high pulsing damage if standing within them. Managing this is mostly on players avoiding them whenever they appear, and will by extension result in reduced DPS due to players avoiding them. Necrotic. All enemies will apply a stacking debuff that deals flat ticking damage, and reduces healing/absorption received by 3%, stacking up to 10 with additional hits. This increases the intensity of tank healing and adds an additional component to the damage they receive. Skittish. Enemies will randomly drop all threat on their current target. This makes it significantly more dangerous for DPS and adds an extra factor for tanks to account for, as dangerous mobs will require additional attention to keep in check. Explosive. Enemies will occasionally spawn Explosive Orbs nearby with a small amount of health. These will will detonate after 6 seconds if not killed, dealing 50% of the all party members' maximum health. These orbs are immune to AoE and crowd control, so need to be switched to and killed quickly throughout the dungeon. Quaking. All players will periodically cause a Shockwave 8 yards around their character, dealing 20% of players' maximum health to any players standing inside it after 3 seconds and interrupting casts. Players should remain spread to avoid taking more than one hit. Grievous. Any players that falls below 90% health will be afflicted by a Grievous Wound, dealing a percentage of the player's maximum health every 3 seconds, stacking up to 5 times. This is permanent throughout the dungeon, so the healer needs to be aware of the stacks and heal players back above 90% to remove the debuff. Tyrannical. Increases the health of boss targets by 40%, and their damage by 20%. This intensifies bosses significantly and must be noted when dealing with some of the more dangerous ones, as it also affects abilities alongside extending the duration of the fights in question. Fortified. Increases the health of minions within the dungeon by 20%, and the damage they deal by 40%. This intensifies the trash pulls significantly and in some cases can limit how many extra you can pull at once, which will slow your pace between bosses. 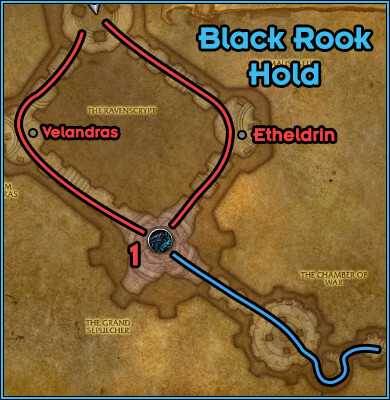 Black Rook Hold is very linear with very few skippable trash groups, so making the mob counter is relatively easy. There are a number of very punishing groups, however, that should be handled with care, so over-pulling can be dangerous. Shortly after entering you will be presented with a path to the left or right, that will determine your route to the first boss. There are two groups accompanied by a patrol as you enter, and a larger more dangerous group at the top of the stairs. When these are defeated the first boss is accessible. Ghostly Protectors will only deal tank damage, but will begin to cast Sacrifice Soul roughly 25 seconds after engaging them. This will reduce damage taken by all other enemies by 75%, but increase the damage the Ghostly Protectors take by 200%. This can be both stunned and interrupted, and your choice should generally depend on affixes, as killing this mob early could trigger Bolstering. If that is not present, take advantage of Sacrifice Soul to burn down the target, unless your group is heavy on AoE, in which case it should be interrupted to capitalise upon that. Ghostly Councilors are caster mobs that should ideally have their Soul Blast cast interrupted quickly to group them up, and otherwise this cast is relatively unimportant as it deals light Shadow damage on a random player. They will also cast Dark Mending, however, which is of the highest priority to interrupt, as it will heal all nearby targets for 15% of their health every second for 5 seconds, which will effectively reset damage on a pack. Ghostly Retainers are the final mob in these groups; they will cast Soul Blade on random targets, dealing a light amount of Shadow damage and leaving a punishing Shadow damage DoT on players for 30 seconds, that can also be dispelled. Players can also receive multiple debuffs, so those who are affected by that should quickly be healed up or dispelled to prevent it getting out of hand. On the left, Lord Etheldrin Ravencrest will come accompanied by two Ghostly Retainers and a Ghostly Councilor, and will attack random targets with Spirit Blast. This can and should be interrupted, but not over Dark Mending from the Councilors, to reduce the damage coming into the group. It will also apply Soul Echoes, which lasts for 10 seconds and drop an Echo every second, creating a telegraph area that will deal high Shadow damage after 4 seconds, so the player affected should stutter step across the room to avoid stacking danger zones. Lady Velandras Ravencrest will be on the right, and will have one of each previously mentioned enemies, a Ghostly Councilor, Ghostly Retainer, and Ghostly Protector. There are two additional casts to look out for, though neither are interruptible. The first is Strike Down, which deals high Physical damage to the tank and increases damage taken, intensifying the pull. Next is Glaive Toss, that will deal high Physical damage to a player and bounce to others nearby, meaning the group should try to remain spread. DPS and Healers spread behind the boss, and move 10 yards or more when Swirling Scythe is cast on you. Move out with Soul Echoes and drop patches, and avoid frontal cone Reap Soul (tank included). Kill souls to avoid Soul Burst in Phase Two. Amalgam of Souls is an encounter that demands correct positioning, but otherwise is quite simple to execute. All players should pay particular attention to Reap Soul which will be cast roughly every 15 seconds. This is a 180 arc in front of the boss when cast, dealing massive Shadow damage to those in the telegraph. No one should be in front when it completes, including tanks, as it does not track its target (so tanks can move away without moving the boss). Swirling Scythe will be cast upon a random non-tank player, and leave a zone on the ground that will deal moderate Physical damage and knock any players who come into contact with it. The targeted player should move away, and everyone should take note and avoid it when moving around the arena. Soul Echoes will be cast on any non-tank player, which will leave behind void zones that will detonate after 4 seconds for high Shadow damage, and fearing anyone hit for 4 seconds. If targeted by this you should move to the edge of the room (but avoiding other dangerous areas of the room) and dropping them in a line. At 50% health, the boss will cast Call Souls, spawning 7 Restless Souls at the edge of the room which will become attackable after roughly 5 seconds. These will move slowly toward the boss and if they reach it, will grant a stack of Soulgorge. After the cast completes, the boss will follow up Soul Burst will deal massive Shadow damage, increasing by 50% for each Soulgorge stack. These adds can be stunned and rooted, and any adds left out of range of the boss when the cast completes will be killed, but not count toward Soulgorge. Use this to your advantage to reduce the number of adds required to kill. Leading up to Illysanna Ravencrest will be a number of high volume pulls, with a spider gauntlet up the stairs leading into a number of pulls with a variety of different Black Rook Guards. These can be quite dangerous so be careful and alert when pulling these groups. After the large 5-target pull in the main chamber, an ambush will appear with Commander Shemdah'sohn, and after this encounter a small 3-mob pack on the stairs leading up to Illysanna. Leading up the stairs after the first boss, there is a large cluster of Spiderlings followed by a smaller group that will have a Spinner join them. Spiderlings can be very dangerous due to the Soul Venom they apply to any target they hit stacking up infinitely, which deals an increasingly high amount of Shadow damage. This can be dispelled and healers should prioritise players who have had a particularly high number of stacks applied. The Spinner, however, has no additional mechanics, and is more of a threat to the tank when coupled with the debuff from Spiderlings. Soul-Torn Champions are particularly dangerous tank adds that will deal high melee damage to their target. They will also periodically wind up a cast of Bonebreaking Strike, that will stun all targets in a short distance in front of the caster for 4 seconds and deal heavy Physical damage. This will not track the target, so the tank should be sure to move behind as well to prevent taking massive damage from other trash. Risen Scouts deal moderate tank damage, and come with one non-interruptible cast in Knife Dance. This will deal high Physical damage to the group every second for 5 seconds, which is particularly dangerous when coupled with other enemies. This should be stunned if possible, and if not, then high defensive cooldowns should be used if they are stacked up at the same time. The patrol Scout will be accompanied by a Risen Companion that will cast Bloodthirsty Leap at a random ranged player, dealing high Physical damage and leaving a massive DoT on the player afterwards, which will stack. This means that when this is pulled the group should spread, and this target should be prioritised. Risen Archers are not tankable, and will cast Shoot at random targets dealing high Physical damage that must be healed up. Periodically, they will begin an Arrow Barrage, that will deal massive damage to players who remain in the cone (especially when coupled with other enemies in the pack) and should be stunned or avoided as a high priority. When the room is cleared, Commander Shemdah'sohn will jump down accompanied by two Risen Scouts and two Risen Archers. It is possible to line of sight these behind a pillar on the right to stack them up, and from there you should treat the Commander as a Soul-Torn Champion (as he will cast the same abilities) and burn down the more dangerous Archers and Scouts. AoE stuns are key here to break out the stacked Knife Dance and Arrow Barrage. The tank should use active mitigation for Vengeful Shear. Spread out to avoid Brutal Glaive bounces, but stack closer for Dark Rush casts. In Phase Two, kill adds (caster priority) and kite Eye Beam away from the group. Illysanna is a two-phase fight that has a large amount of unavoidable damage that must be kept up with. Tanks are required to pass a mitigation check through Vengeful Shear. This deals massive Physical damage and requires the respective defensive tools to be active when the cast completes (such as Shield Block or Ironfur), or they will receive a stacking 100% damage taken increase for 30 seconds. Non-tank players should remain spread to avoid bounces from Brutal Glaive, which deals low Physical damage and applies a 30-second debuff that repeats this damage every 2 seconds. This will jump between any other players within 8 yards. She will also cast Dark Rush, which will cause her to jump between marked players for moderate Physical damage and leave a Blazing Trail in her wake that deals high Fire damage every 2 seconds to players remaining in it. Players marked should try to loosely stack up to limit her movement and reduce the area covered by the Trail. When Illysanna reaches maximum Energy, she will leap to the balcony and begin Phase Two. She will begin channelling Eye Beam on a target, following the player and leaving a patch of Felblazed Ground in the area it moves along, which deals high Fire damage every second to players within it. If targeted, you should try to track this along the edge of the room and avoid covering the area in front, and around the adds that will spawn. Two adds will also spawn, a Soul-torn Vanguard (which works the same as a Soul-Torn Champion) and a Risen Arcanist. They should be grouped and burned down quickly, ideally in range to also cleave onto the boss at the edge. Arcane Blitz from the Arcanist should be regularly interrupted, and burning him down is the priority. The Vanguard will routinely cast Bonecrushing Strike in front of him, stunning targets for 4 seconds. This can be avoided by all including the tanks, so he should be faced away from the group and players should move behind when it begins. Smashspite the Hateful has a massive amount of trash following Illysanna, spreading two floors and two staircases including a gauntlet. You will first encounter falling rocks on the staircase that will either come on the left or right (and if you are hit, will deal massive Physical damage with Boulder Crush). When any player reaches the top, these will stop. Following that is a number of brutal Demon groups, and another staircase with the same mechanics. Finally comes a gauntlet with Felguards and Felbats, which when completed will lead you to Smashspite. This final gauntlet is of particular danger during a Bolstering fixate, so be very careful when managing these pulls not to chain the buff too much. 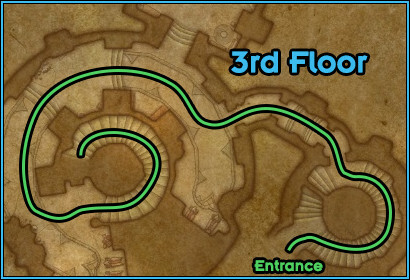 The Wrathguard Bladelords will both patrol with Bloodscent Felhounds, and be present at the base of the second floor staircase. They present a massive threat to tanks, not only through their regular attacks but also through the Brutal Assault cast. This will repeatedly deal massive damage to the tank every half second for 2 seconds, which can and should be stunned. In an emergency, the tank can kite the mob away to prevent its damage, but be very wary of the channels particularly in packs with multiple Bladelords. When it reaches 25%, it will Enrage, dealing higher damage and increasing attack speed, making them even more deadly. This encourages bringing them low together and killing them at the same time to reduce risk. These will also patrol with Bloodscent Felhounds, which will accompany the patrolling Bladelord, which will simply deal damage to the tank. Wyrmtongue Tricksters fill up the room but are mostly just a trash mob that deals additional tank damage. Wyrmtongue Scavengers, however, present an increased threat that can be variable depending on the result of "Drink" Ancient Potion. This will usually be cast 10-15 seconds after being engaged, and produce one of 3 different effects. Frenzy Potion will increase the size of the Wyrmtongue, and cause it to gain 400% additional attack speed and 5% extra damage for each second active. These are incredibly dangerous and should be actively stunned if they spawn, as a tank will quickly melt underneath the damage they deal. Hyperactive will cause the Wyrmtongue to spin around fixated on a player, that will trigger Bowled Over! if they are hit. They should ideally be stunned and kited around. When the effect ends after 10 seconds, they will become Dizzy and stunned for 3 seconds. After that, they will resume spinning. Indigestion will cause the Wyrmtongue to breathe fire for moderate Fire damage every second to players who remain in the area. If this cannot be stunned, players should move behind, and the tank should face the mob away from the party to reduce group damage. Lastly, Scavengers will also cast Throw Priceless Artifact before consuming their potion, which will create small telegraphs around players. If you remain within the area it will deal light Physical damage, and should be avoided. This will spawn as a gauntlet leading up the final encounter. There will be one at the base, two on the first plateau, two at the top, and two in the final room, and Fel Bat Pups will continue to spawn throughout your ascent. The bats need to be controlled and AoEd down (though watch out for Bolstering), especially to deal with Sic Bats! which will focus a player in the group and deal massive damage to them; AoE stuns are especially useful here. Felspite Dominators will routinely cast Felfrenzy, which can be interrupted or dispelled, which will increase their damage dealt by 15%, and size/attack speed by 25%. If this gets out of hand, the tank will be in extreme danger, so make sure to stun this out or interrupt the casts. Position Fel Vomit across the edges of the room if targeted. Block Hateful Charge with a tank if possible, but avoid stacking debuff past 2, or soaking during Brutal Haymaker. This is a high damage fight, but all mechanics are relatively simple. Players should all be aware of when Hateful Gaze is cast, and block it themselves to stop him moving too much. This should generally be rotated, although tanks can soak additional hits with cooldowns. DPS and healers should not soak more than one in a row, however, due to the massive 300% increased damage taken debuff that will remain for 30 seconds, so a rotation should be organised between the group. Tanks and healers should also be very aware of Brutal Haymaker casts, which will be cast at 100 Energy, dealing massive Physical damage and leaving a 75% damage taken debuff. Due to this, tanks should avoid soaking Hateful Charge whilst this is active. 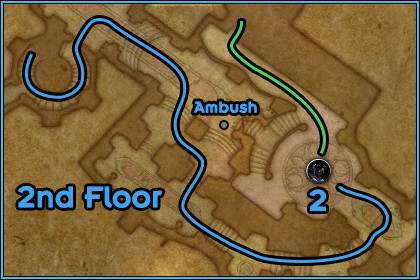 Finally, every 30 seconds a non-tank player will be targeted by Fel Vomit, which after 5 seconds will spew Fel Vomitus in a line between the player and the Felbat that casts it, which is indicated by the line on the ground. This should ideally be positioned to fire along the edge, to reduce areas on the platform that will be cut off due to the high damage patch left on the ground. While this should ideally be soaked one by one to mitigate the effect of the debuff, note that guaranteed avoidance (such as Evasion or Riposte for Rogues) can block a hit regardless of stacks. Just be careful when using this as the charge is lethal with a debuff present. Lord Kur'talos Ravencrest has a mercifully short trash run up the stairs through his Ravenguard, leading to the final encounter. You will only experience two different types of mobs here, and you can (if comfortable) pull groups together; just be wary of their mechanics. Risen Lancers will deal light tank damage, but regularly cast Raven's Dive. This will place a telegraph on a random player in the group and after 2 seconds, deal high Physical damage and stun them for 5 seconds, so players should immediately move out of this to avoid getting caught. Risen Swordsmen will deal high tank damage, and cast Coup de Grace, which will deal massive damage to the target. Powerful defensive cooldowns should be used to survive, alongside the healer being aware and able to react to the damage. Avoid Whirling Blade and its bounce back, and Dark Blast in Phase One. In Phase Two, use defensive/group cooldowns for the first Shadow Bolt Volley, burn cooldowns when Legacy of the Ravencrest is applied. Avoid Cloud of Hypnosis, and move into melee with Stinging Swarm to cleave down. Move anti-clockwise to avoid Dark Obliteration during Dreadlord's Guile. Lord Kur'talos Ravencrest is a two-phase fight, the first of which is quite brief. You will initially be attacking Kur'talos himself, who will deal relatively high tank damage and apply Unerring Shear, dealing high Physical damage and leaving a light DoT. DPS and healers should be aware of Whirling Blade casts, which will launch a Glaive out from the boss in a line that will deal high Physical damage and knock targets hit back, travelling out from the boss and then back in when it reaches the edge of the arena. Lastly, the secondary untargetable enemy, Latosius, will routinely fire out Shadow Bolt dealing moderate Shadow damage to random group targets that must be healed. He will also send out Dark Blast casts, which will leave a large telegraph on the ground that will detonate after 1.5 seconds, dealing massive Shadow damage and knocking back affected players, which must be avoided at all costs. Phase Two begins when Kur'talos is defeated, spawning Dantalionax. For the first 15 seconds you will be very vulnerable as the buff from Kur'talos has a delayed effect, so defensive cooldowns should aggressively be used here to survive. After 15 seconds, Legacy of the Ravencrest will be applied increasing the health, damage, and healing done of the group by 300%, allowing you to stabilise against the high damage from the boss. He will fill most of his time either hitting the tank for extreme damage, or casting Shadow Bolt Volley which will also hit the entire group for high damage. He will routinely cast Stinging Swarm on a random player in the group, which has a chance to stun players for 0.5 seconds when they deal damage or heal, alongside dealing light Physical damage every second. When afflicted by this, move to the melee and cleave it down quickly to remove the effect. There will also be Cloud of Hypnosis casts from the boss, which will spawn a slow-moving green cloud in the arena, that will persist for the remainder of the fight. If you enter the cloud you will be put to sleep, and though this effect is removed when taking damage and can be dispelled, players should actively avoid this in particular during Dreadlord's Guile. Roughly every 45 seconds, he will cast Dreadlord's Guile, disappearing for 15 seconds and beginning a chain of Dark Obliteration. This will spawn a series of telegraphs similar to Dark Blast from Phase One that will detonate every 1.5 seconds, dealing massive Shadow damage in an anti-clockwise direction. Players should stack and move quickly against this, avoiding Hypnosis Clouds on the way round. This 1-minute cycle will repeat until the boss is defeated. You should always attempt to line up cooldowns with Legacy of the Ravencrest, so try to predict your timer between the first Phase and this. Saving Bloodlust until after the first Dreadlord's Guile is complete is ideal, as you will burn a significant amount of the uptime without a target if you use it immediately after Legacy is applied, so save your own personal cooldowns for this accordingly.